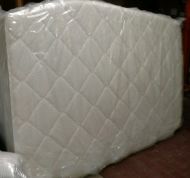 Our custom built oversized mattresses come in any Large mattress or custom sized extended mattress. Any shape or size is doable from our craftsman in the extended mattress. The oversized bed pictured is 96" x 108" however, we can make 96" x 96" or 108" x 108" or anything in between. Each oversized mattress is handcrafted with care in order to receive a high quality product. These extra wide king beds can be made as a natural mattressor out of memory foam.